Cotton is a soft staple fibre that grown in a form known as a boll around the seeds of the cotton plant, a shrub native to tropical and subtropical regions. Cotton today is the most used textile fiber in the world. Its current market share is 56 percent for all fibers used for apparel and home furnishings and sold in the U.S. Another contribution is attributed to nonwoven textiles and personal care items. The earliest evidence of using cotton is from India and the date assigned to this fabric is 3000 B.C. There were also excavations of cotton fabrics of comparable age in Southern America. Cotton cultivation first spread from India to Egypt, China, and the South Pacific. Cotton is a soft, staple fiber that grows in a form known as a boll around the seeds of the cotton plant, a shrub native to tropical and subtropical regions around the world, including the Americas, India, and Africa. The fiber most often is spun into yarn or thread and used to make a soft, breathable textile, which is the most widely used natural-fiber cloth in clothing today. The English name derives from the Arabic (al) qutn قُطْن , which began to be used circa 1400. Each cotton fiber is composed of concentric layers. The cuticle layer on the fiber itself is separable from the fiber and consists of wax and pectin materials. Cotton is a soft fiber that grows around the seeds of the cotton plant. Cotton fiber grows in the seed pod or boll of the cotton plant. Each fiber is a single elongated cell that is flat twisted and ribbon-like with a wide inner hollow (lumen). 90% cellulose, 6% moisture and the remainder fats and impurities. The outer surface is covered with a protective wax-like coating which gives fiber an adhesive quality. Cotton is a natural fiber that is grown in countries around the world. It is a crop that requires adequate moisture and heat to mature and produce quality fibers. Cotton growing tends to be in warmer climates. Cotton is a true commodity in the world markets and supply and demand truly affect prices of raw cotton. Comfortable – there are no surface characteristics of cotton that make it irritating to human skin. Cotton feels good against skin; it has a soft hand. Hydrophilic – cotton has a natural affinity for water – it attracts moisture away from your body. Good Heat Conductivity – Cotton allows heat to dissipate making it a wonderful fiber to maintain a comfortable sleeping temperature. lack of luster (colors are usually dull). It has 10%increase in strength when wet. In general, long staple cotton is needed to spin the yarns needed in the weaving of the finer down proof cotton fabrics. Long staple cotton is considered to be finer quality because they can be spun into finer yarns and those finer yarns can be woven into softer, smoother, stronger, and more lustrous fabrics. Long staple cotton makes stronger yarns, especially in fine yarns, as there are fewer fibers in a given length of yarn and the longer fibers provide more points of contact between the fibers when they are twisted together in the spinning process. Common areas that grow long staple cotton in the world would be Egypt, Sudan, the United States (Pima cotton grown in the west and southwest are long staple cotton), and Western China. The two most widely known long-staple cottons are Egyptian cotton and Pima cotton. Pima cotton is grown mainly in the United States, but also in Peru, Israel, and Australia. The fibers are sent to a textile mill where carding machines turn the fibers into cotton yarn. The yarns are woven into cloth that is comfortable and easy to wash but does wrinkle easily. Cotton fabric will shrink about 3% when washed unless pre-treated to resist shrinking. Cotton is prized for its comfort, easy care, and affordability and is ideal for clothing, bedding, towels, and furnishings. Cotton was once harvested by hand, often by slave labor or tenant farmers. As recently as 1965, over a fourth of the U.S. cotton crop was picked by hand. Today, harvesting cotton is highly mechanized. Harvesting machines called strippers and pickers efficiently remove the cotton while leaving the plants undisturbed. Spindle harvester, also called a picker, has drums with spindles that pull the cotton from the boll in one or two rows at a time. Even a one-row mechanical picker can do the work formerly done by 40 hand pickers. In stripper harvesting, the stripper moves along rows of plants, passing them between revolving rollers or brushes that pull off the cotton. Strippers also pull twigs and leaves with the cotton. Cotton gins separate the fibers, called lint, from the seeds. After ginning, the cotton goes to the bale press that packs it into 480-pound bales about the size of a large refrigerator. Cotton buyers judge cotton on the basis of samples cut from the bales. Skilled cotton classers grade or “class” the cotton according to standards established by the US Department of Agriculture such as cleanliness, the degree of whiteness, length of the fiber, and fiber strength. The classes pull a sample. 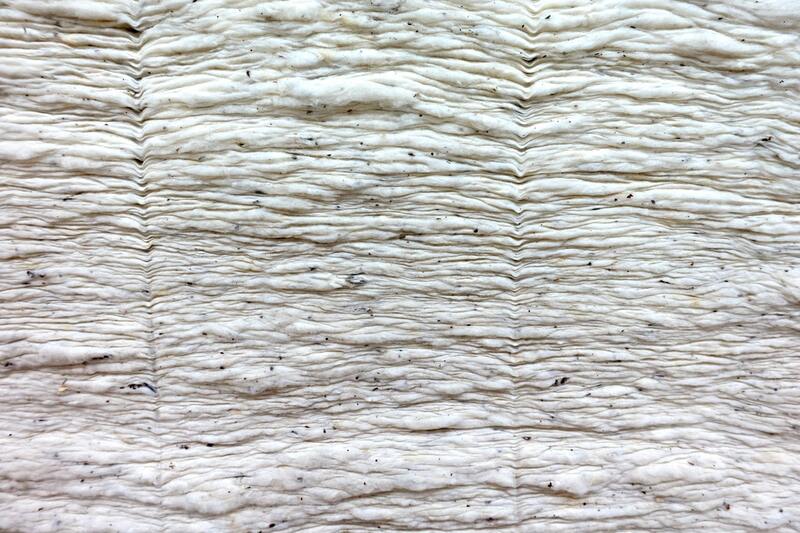 They discard most of the cotton until just a pinch of well-aligned fibers remains. They measure the length of the fibers, referred to as staple fibers. Longer staple fibers are higher-grade cotton and are sold at higher prices. Long staples range from 1.1 inches to 1.4 inches long. From the field, seed cotton moves to nearby gins for separation of lint and seed. The cotton first goes through dryers to reduce moisture content and then through cleaning equipment to remove foreign matter. These operations facilitate processing and improve fiber quality. The cotton is then air conveyed to gin stands where revolving circular saws pull the lint through closely spaced ribs that prevent the seed from passing through. The lint is removed from the saw teeth by air blasts or rotating brushes and then compressed into bales weighing approximately 500 pounds. Cotton is then moved to a warehouse for storage until it is shipped to a textile mill for use. A typical gin will process about 12 bales per hour, while some of today’s more modern gins may process as many as 60 bales an hour.